Explore Norwalk's Waypointe Neighborhood at "Wine Down at The Block"
What if I told you that for just over $25, you could enjoy food and a beverage from four popular restaurants in one of Fairfield County's up-and-coming neighborhoods? And I'm not talking about small-sized portions cobbled together from leftover ingredients or the cheapest bottled beers. I mean delicious dishes straight from the menu alongside specialty cocktails, craft beers, and wine. You'd probably think I'd gone crazy... but it's true. "Wine Down at The Block" affords participants the chance to explore Norwalk's Waypointe neighborhood at an affordable price. Barcelona Wine Bar, Sedona Taphouse, Bobby Q's Cue & Co., and Colony Grill all offer a dish and a drink as part of the package, while vendors like Pinot's Palette, Endurance House, and Salon by JC provide demonstrations and discounts. I was invited to try the August installment of the Wine Down, and, spoiler alert: it is as good as it sounds! 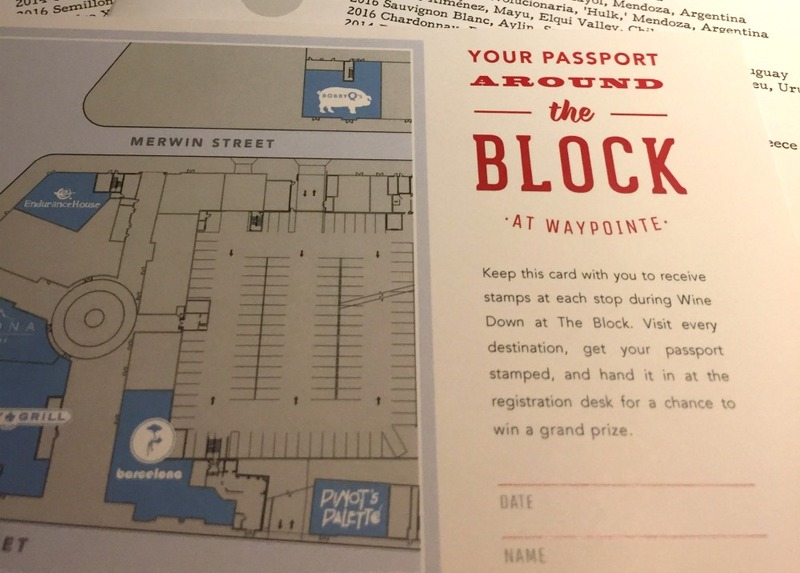 Prior to the Wine Down at The Block, I had not yet visited Waypointe. I'd always meant to; I figured that a place that could draw Barcelona away from its longtime SoNo location must be interesting. I just never made it. It turns out that Waypointe is a luxury apartment community on West Avenue away from the chaos of downtown and with ample FREE parking. An elegant central piazza lies in its center. With the exception of Bobby Q's, the restaurants encircle it. Diners opting for "outdoor" seating look out onto the piazza, with the surrounding apartments completely separating them from the city beyond. It almost felt like Epcot. The stony ground, fountain, twinkle lights, and "outdoor" tables gave the illusion of a European city. At the same time, the uniformity of the buildings and the towering apartments constantly reminded me that I was in a constructed environment. Upon check-in, we were given a wristband as well as a "passport" to have "stamped" over the course of the evening. It also contained a map to help us find our way to the various destinations. Participants who visit every stop can turn in their passport at the end of the evening for a chance to win a prize. We opted for Barcelona Wine Bar first. As soon as we identified ourselves as part of the Wine Down, they gave us a menu. We had our choice of ten Barcelona staples, from their signature Hangar Steak to the Gambas to the Chorizo with Sweet & Sour Figs. For a beverage, they served a glass of their white or red sangria. (They also let me substitute the sangria for one of their happy hour wines.) We left our first stop completely satisfied! From there, we journeyed over to Bobby Q's Cue & Co., the reincarnation of Westport's Bobby Q;s Bodacious BBQ. Here, we could select one of the cold brews on tap and customize four "wood-kissed" wings with one of the restaurant's famous rubs or sauces. At first, I thought four wings sounded like a skimpier deal, but Bobby Q's proved otherwise. The wings were plump, crispy, flavorful, and filling! The "Naked Smoked" rub had tasty hints of mesquite and notes of campfire. We probably should have given our stomachs a break, but we continued onto Sedona Taphouse. We'd started out right at 6pm when the event began, and by 8:00pm it was getting significantly more crowded. We stayed ahead of the crowd and secured a table near the bar. Sedona was truly generous with their options. In addition to select beer and wine, Sedona offered Wine Down-ers one of their craft cocktails or specialty martinis as part of the package. I chose "The Zen," a martini with Grey Goose, fresh basil, cucumber, and lemongrass, which usually sells for $12 on the menu! For food, we were allowed to choose one item from almost all of their starters and small plates. I selected salmon sliders that also came with a small green salad. We never did make it to Colony Grill (due to our very full tummys), but if we had we could have ended the night with another beer and hot oil slices. Unfortunately, we also missed Pinot's Palette. We wanted to take advantage of their $15 mini paint session and credit for a future class, but found out too late that they closed at 8pm. Wine Downers take note if you want to embrace your artistic side! It is also important to note that the $25 ticket does not include gratuity. The servers and team members are welcoming, friendly, and knowledgeable and tips are very much appreciated! The Block at Waypointe hopes to continue the Wine Downs in the weeks ahead. So far, they have taken place once a month on Thursday nights from 6-10pm.